Just a week ago I landed in Tegucigalpa, Honduras in one of the scariest plane landings I have ever experienced. My travel companion, Christian Courtin-Clarins, the Chairman of Clarins, was by my side as I gripped my seat as we made our harrowing decent toward the runway. Our visit had officially begun. 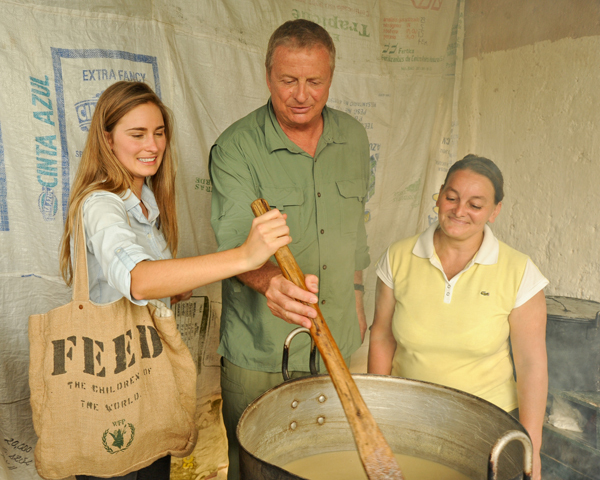 Clarins has been a partner of FEED for the past year and a half. FEED is a social business I started five years ago with the mission to create good products that "FEED" the world. So far we have launched three FEED bags with Clarins, all filled with Clarins skincare products that have been sold at Nordstrom and Bloomingdales. Each product sold has raised funds to give school meals, with the overall goal of our partnership being to raise at least 1 million meals. The Clarins team had joined me on this trip to Honduras, one of the most dangerous countries in the world right now, to see the distribution of the school meals for themselves. Shortly after disembarking, we found ourselves at a local urban school that is one of the thousands of schools in Honduras to receive food from the U.N. World Food Programme. We were immediately welcomed by the principal of the school and the uniformed students with speeches, the Honduras national song, and traditional dances. Then the student-body president, Victor, gave a moving address about how WFP school meals are so essential to him and his fellow students. Once the welcoming was over, we visited classrooms, where students were eating beans, rice, tortillas, CSB (corn-soy blend), and vegetables. They happily devoured their meals, giggling at our broken Spanish as we tried our best to ask them questions and interact. Our visit to this school ended with students writing down their names so that I could "friend" them on Facebook. I left feeling even more amazed at how interconnected our world is, and also feeling an even more pressing urgency to help these children who have been born into a life of poverty and hunger. Through the rest of our days in Honduras, I was able to talk more to Christian as we rode in the back of a U.N. vehicle for hours to various regions of Honduras, visiting schools, clinics, and farms. His business savvy, passion for ecology and helping the world, and general zest for life made the trip a life-affirming experience. When he talked to students in his French accent, smiles would light up their faces. Christian and Clarins' commitment to helping FEED's mission was ever-present and reinforced by our travels together. It is one thing to talk about the issues that face the millions of hungry people around the world, but it is another to go and see firsthand. We sat with subsistence farmers and heard about their struggles to make ends meet because their maize-drying machine had just broken; we visited with teachers and mothers who rigorously prepare the school meals each day for their kids and experienced how hot and smoky their unventilated kitchens were; and we sat in very primitive classrooms with kids in clean uniforms who were eager to learn. Coming home from our travels, our commitment to our million-meal goal is even stronger. On May 30 we will be putting on the Clarins Million Meals Concert for FEED at Lincoln Center, with the goal of raising at least 1 million school meals in one night. (These meals are in addition to the funds we continue to raise through our product partnership.) Hosted by Nick Cannon, himself a hunger-relief advocate, the concert will feature renowned artists such as John Legend, Natasha Bedingfield, Alan Gilbert, Chris Eschenbach, and David Aaron Carpenter. President Bill Clinton will be speaking. It will be a night to remember, and 1 million children in Honduras and other countries around the world will receive their nutritious school meals thanks to those who support our event.